Everyone loves outlet shopping! At these Greater Phoenix malls you'll find brand name merchandise, often at 25% or more off compared to regular mall department stores. While your best bet is items like shoes, accessories and clothing, there are usually also jewelry stores, home or kitchen stores, and others. These stores all offer new, first quality merchandise although the styles may have been discontinued or be out of season. Tanger Outlets is an open-air mall adjacent to Westgate Entertainment District in Glendale. There are movies with walking distance. These outlet stores are also near Cabela's and ​Gila River Arena. Take Loop 101 (Agua Fria) north to Glendale Avenue. Turn east on Glendale Avenue. Stay on the right side of Glendale Avenue and make the first right on 95th Ave. Tanger Outlets is on your right. Phoenix Premium Outlets are located just off I-10, and is located on the Gila River Indian Community. It is right next to the Wild Horse Pass Hotel & Casino, and within a mile of the Sheraton Wild Horse Pass Resort & Spa and Rawhide Western Town. There are no movies here. An open-air shopping mall located north of Phoenix, just off I-17, just 15 minutes north of the loop 101. There are no movies here. Outlets at Anthem has several community events throughout the year, and is especially known for their Christmas festivities that are free and open to the public. 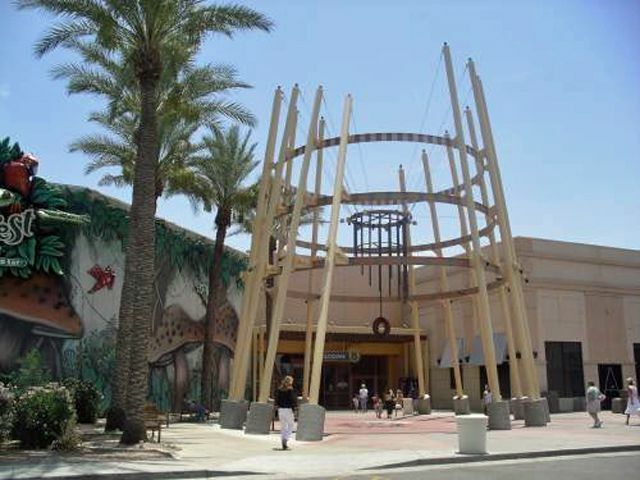 Arizona Mills is the largest and only indoor outlet store mall in the Greater Phoenix area. While not all stores in this mall are outlet stores, many of them are and offer discounted selections for name brands. This mall also has a full food court, movie theaters, Sea Life Arizona aquarium, and LEGOLAND Discovery Center. From the east: Take US60 Superstition Freeway westbound and exit at Priest Drive south, Exit 172. Turn left (south) on Priest. Stay on right to enter mall. From the north, south and west: Take I-10 Maricopa Freeway exit at Baseline Road, Exit 154. Turn east and stay to the left to immediately enter Arizona Mills Mall.